Capable of counting and batching at speeds up to 2,500 packages per hour, this vibratory counter infeed system is engineered with state-of-the-art technology for high-accuracy counting productivity. When used in conjunction with the Autobag AB 180™ bagging system, a bulk supply of product is driven to a single-flow that is automatically counted and batched to a pre-set quantity. The individual batch of product is then funneled to a pre-opened poly bag, sealed and dispensed, while another bag is presented for loading. 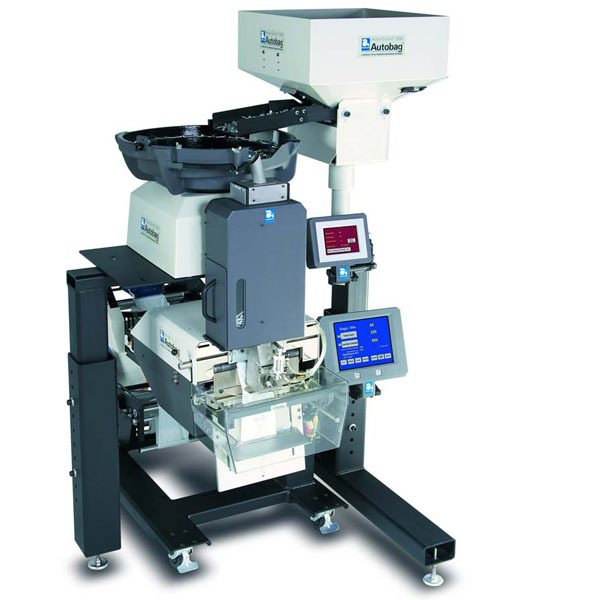 DeviceNet communications capabilities enable simple, fast and reliable integration of the Autobag Accu-Count 200, high speed counter, counter infeed systemAccu-Count to Autobag baggers and Kit-Veyor® systems. Technology advancements include comprehensive system diagnostics from the bagger’s AutoTouch™ Control Screen, and automatic sequencing in Kit-Veyor kit packaging operations. The operator-friendly touchscreen also provides access to job set-up and recall, on-board system diagnostics, and real-time productivity data. Using system-matched Autobag pre-opened bags-on-a-roll, the Accu-Count 200 offers a fast and effective counting and packing solution.